Have you thought about participating in Public Service while using your Amateur Radio station? There are many opportunities to participate with RACES, ARES, and SKYWARN as well as assisting with various community events. A Technician License is sufficient to get involved. Training will be provided. • Activated by local, county and state jurisdictions and are the only Amateur Radio operators authorized to transmit during declared emergencies when the President of the United States specifically invokes the War Powers Act. This web site is intended to assist in the distribution of RACES Auxiliary Emergency Communications information. Updated RACES documentation and other emergency preparedness documents are available through the RACES Resource Library, maintained by RACES volunteers registered with the Arlington County, Virginia Office of Emergency Management, Emergency Support Function #2. NIMS is the National Incident Management System. NIMS is intended to be used by the whole community. The intended audience for this section is individuals, families, communities, the private and nonprofit sectors, faith-based organizations, and local, state, tribal, territorial, and federal governments. NIMS provides a common, nationwide approach to enable the whole community to work together to manage all threats and hazards. NIMS applies to all incidents, regardless of cause, size, location, or complexity. It also describes common functions and terminology for staff in Emergency Operations Centers (EOC), while remaining flexible to allow for differing missions, authorities, and resources of EOCs across the nation. NIMS Training is available online at https://www.fema.gov/training-0#. The ARRL Field Day is an annual amateur radio exercise, widely sponsored by IARU regions and member organizations, encouraging emergency communications preparedness among amateur radio operators. In the United States, it is typically the largest single emergency preparedness exercise in the country, with over 30,000 operators participating each year. Field Day is always the fourth full weekend of June, beginning at 1800 UTC Saturday and running through 2059 UTC Sunday. 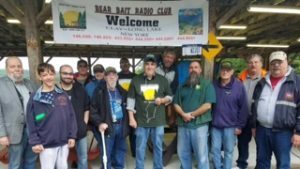 The Bear Bait Radio Club plans and executes a weekend long event participating in Field Day at Mount Sabattis in Long Lake. The Town of Long Lake provides their community facility for our use that weekend, and the public is invited to join us. We typically setup Friday, operate on Saturday into Sunday, and pickup Sunday afternoon. Our typical setup includes multiple radios and antennas covering CW, digital modes, and phone. Come join us and see amateur radio in use for a simulated emergency. Get to know the members of the Club. More details to follow as the date gets closer. This sounds like fun. Perhaps with some warm food and beverages too! 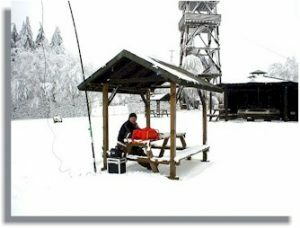 As described on their website, https://www.winterfieldday.com; Winter Field Day Association (WFDA) is a dedicated group of Amateur Radio Operators who believe that emergency communications in a winter environment is just as important as the preparations and practice that is done each summer but with some additional unique operational concerns. When: Winter Field Day runs for 24 hours during the last full weekend in January each year from 1900 UTC (2pm EST) Saturday to 1900 UTC (2pm EST) Sunday. For 2019, the dates are January 26th and 27th. Station set-up may commence no earlier than 1900 UTC (2pm EST) on Friday, January 25th. Station setup may consume no more than 12 hours total. How & when you schedule/spend those 12 hours is up to you. Bands: All Amateur bands, HF, VHF, & UHF except 12, 17, 30 and 60 meters. HF SSB – lowest 30 kHz of the US General Class Phone bands (160m- 15m), 28.400-28.425MHz (10m) 6m/VHF/UHF – adjacent to, but not on, nationally recognized simplex calling channels. Indoor: Operation from inside a remote, insulated, heated (or cooled, depending on your local weather), and weather-protected structure where an Amateur station is normally not available. (Park buildings/cabins, community center, EOC, senior center, club shack, etc). Outdoor: Operation from a location partly or fully exposed to the elements and at least 30 feet away from your normal station location and not using any part of a previously erected antenna system or ham station. A campground, park pavilion, canopy, picnic table, tent, pop- up camper, or a backyard shed/tent/deck, etc may be used. Operation from a non-insulated car/truck/van/boat (mobile or not) is considered “outdoor”. Home: Operation from inside a home or inside another structure attached to a home that could or would be the usual location of an Amateur station (garage, sunroom, etc), generally using a previously erected antenna system. A “Home” entrant may still be eligible to claim the “alternate power” bonus if not using commercial power. Use of any pre -existing (on site) or permanently installed antenna system or station components renders your station a “Home” station. Exchange: Your WFD exchange will be a combination of your “class” and “category” and your ARRL section as described below, using an appropriate letter designator or phonetics (examples: 1I, 2H, 5I, 6O, 3H, 9I, etc) In short: Call sign, Class + Category, ARRL Section. In summary: There are only 3 categories of entry: Indoor, Outdoor, and Home as described above and in the definitions. Your entry class will depend on the number in your exchange. That number will be determined by the number of stations capable of simultaneously transmitting at your WFD site. If you only have one station set up, but plan on using it on several bands and modes (example: 160-2m, CW, SSB, FM, Digi, etc), the number in your exchange would be “1”. If you have 10 stations set up and operators working at all of them, regardless of bands, and modes, the number in your exchange would be “10”. If you have only two operators, but have two HF stations set up and a third and possibly fourth station dedicated to VHF, UHF, or a Satellite contact, your exchange number would be “2”, as one op would have to leave a station idle to make contacts on the other. In other words, don’t count a station where one station has to be left idle to make contacts on another. Once you decide upon your number of stations (class), you must use it for the duration of the contest. There are no points awarded for number of stations and it does not affect your score. *** More details and scoring information can be found at the https://winterfieldday.com web site. Do you wonder how far your radio station will reach? One method is via use of the WSPR mode of digital transmissions and then by viewing the response on the WSPRnet website, http://wsprnet.org. To view that response, it is necessary for you to create a free account to verify that you are a licensed Ham and that the provided call-sign is yours. Once you have your account approved you can log into wsprnet.org with your username and password to access their graphically mapped results of your transmissions. WSPRnet allows you to set the parameters as well for what time period your signal was received. I was surprised the first few times I tried WSPR to find just how far my signal reached. I made it to Australia and Antarctica on a couple different nights. The WSPRnet map can be zoomed in and out to fit your screen size. The WSPRnet map of your signal can also be saved and/or printed using screen capture software.